This XKCD comic illustrates something I’ve been thinking a lot about lately. There are just too many instant messaging protocols / services. 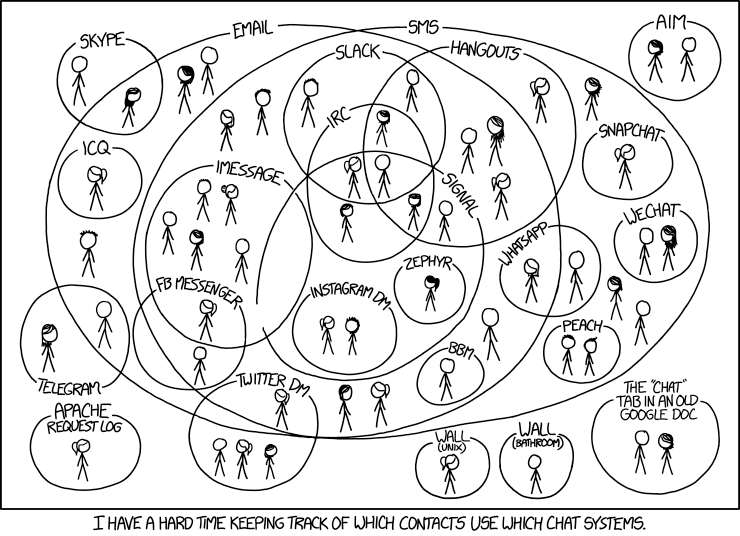 I’ve got contacts in different settings who all use different instant messaging apps. In most cases, I try to stick with SMS and e-mail. The problem is with services like Facebook, which gives the impression that everybody are “online”. I don’t have the Messenger app on my phone, and it may take a while before I’m around FB to reply. Some contacts assume I’m always on their “hip” IM of choice, and confusion ensue.